Raccoon feces can cause damage to a home and create an unwanted mess. When raccoons are in an area they will create what is called a raccoon latrine. The good thing is, that this means raccoon feces should be concentrated in one major area. Knowing how to clean up this area properly is important, and will keep a home from being damaged and the people living there healthy. Identify the feces as raccoon feces. Raccoon feces is tubular in shape and has the diameter of a dime or nickel. It will have blunt ends and will normally be dark in color. Old feces will discolor and change shape with age. There might be seeds and shells located around or in the deposits. Search common areas where a raccoon latrine is located. Raccoon latrines are normally flat and off the ground. Roofs, decks, crawl spaces, and unsealed attics are prime locations inside or around homes. Outdoor raccoon latrines are normally found in haylofts, around fence lines, large rocks, and fallen trees. These are not the only locations possible for a raccoon latrine, but they are the most common. These areas will have new feces lying on top of old feces, to make identification easier. Dress in the proper safety gear. Rubber gloves will prevent feces from getting on the hands, rubber boots can be washed to prevent spreading and a particle mask will help avoid any accidental ingestion. A mask will also help with the smell. Remove the raccoon feces from an area. First gently mist the area with a spray bottle to prevent dust and feces from stirring up. Scoop the feces, soil, and contaminated area with a shovel. Place the contaminated materials into a heavy duty trash bag. Once all the feces is removed and placed in the trash bag, tape the top of the bag shut. Double bag the feces and place it in a garbage can or dumpster. Disinfect the area, if possible. For indoor areas use a sponge that is damp with soapy and hot water to scrub the area. Rinse often and flush the dirty water. Dispose of the sponge and disinfect all of the equipment used such as buckets and shovels. Cleaning up raccoon latrines is a great way to prevent raccoons from coming back. However, it might be necessary to change certain elements of a yard and patch up access points to the home to make sure raccoons do not come back. 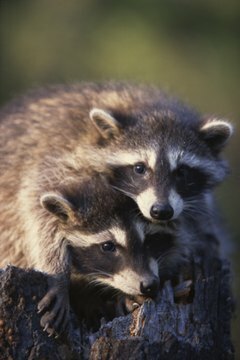 Raccoon feces may contain roundworm which can be dangerous to human health. This means feces should be cleaned but it is very rare that any human gets the disease. Proper safety precautions when cleaning should prevent any chance of suffering from roundworm.